Readers may be aware that editor-in-chief Malcolm Ginsberg cruised from Sydney to Singapore in February on Norwegian Cruise Lines (NCL) Jewel. The March Cruising issue described the seaborne part of the trip and here we focus on Newcastle and Darwin, places en route. Brisbane was highlighted in April. The Great Barrier Reef will follow and finally Indonesia. New South Wales' second city can be twinned with the place of the same name in the county of Tyne and Wear, England. Both were great centres of the coal industry and that was how the Australian one got its name. Newcastle NSW still depends on the fossil fuel for its economy and is the world’s largest coal port. For the British version, coal is history. Sydney to Newcastle is 100 miles and just a slow overnight cruise for Jewel. The city dates from the beginning of the 19th century and gained a reputation as a "hellhole", as it was a place where the most dangerous convicts were sent to dig in the mines as harsh punishment for their crimes. During World War II, Newcastle was an important industrial centre for the Australian war effort. In the early hours of 8 June 1942, the Japanese submarine I-21 briefly shelled the city. Coal and steel plus shipbuilding were the major industries until the end of the last century and it was from here that the structure of the Sydney Harbour Bridge was put together. It was also a major railway centre. Today, it is a thriving semi-tropical municipality embracing its indigenous, colonial, maritime and industrial past. A courtesy bus dropped us near the start of the Newcastle Memorial Walk built to commemorate the 100th anniversary of the ANZAC landing at Gallipoli in 1915. At 650m long (Australia is metric but they drive on the left), the walkway winds its way around the cliff edge and offers unsurpassed views of the beaches, city and up into the Hunter Valley. It is a fine introduction to Newcastle and its beaches. 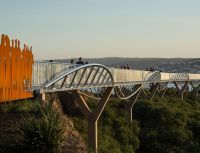 The walk features a 160m cliff-top bridge adorned with steel silhouettes of soldiers inscribed with close to 4,000 family names of almost 11,000 local men and women who enlisted during World War I. It also links a 6km coastal walk. Next stop the Newcastle Museum and a tour with director Julie Baird. Located in the historic Honeysuckle Railway workshops, the museum is right in the heart of Newcastle and our visit coincided with opening of an interactive spider exhibition (until 29 April 2018), not something that would normally appeal but fascinating all the same. Spiders can spin webs, climb, swim, dance, parachute and they can even drop a limb when threatened and grow it back. Quite the opposite, Fire and Earth unveils the hot and heavy industrial heart of the city in a spectacular showcase of the region’s major industries. The museum provides a journey through times of war and immigration, sporting moments and famous identities. The buildings were erected as part of the railway expansion from the 1850s and an engine from the early days is on display as well as a 1920s tram and a locally-assembled with its original components model T Ford that was hidden in a barn for many years. Visitors next year will be able to take a tram to the museum, which, like many such institutions in many places all over the world, is making a comeback. Victoria Theatre on Perkins Street is the oldest purpose-built theatre in Australia. The official walking tour is more or less flat, just over 3mi and takes 2hr 30min depending on how long you linger at the 12 highlighted sites. Our final stop was Fort Scratchley, which overlooks the harbour entrance and has protected Newcastle since 1882. It was from here that the firing from the Japanese submarine was returned (very accurately according to the captain, who promptly submerged). The gun was again fired at one o’clock and also as Jewel departed. There is a collection of historical display rooms and we were able to tour the tunnels, an assortment of corridors and chambers connecting the magazine, gun emplacements and the casement. The capital of Australia’s Northern Territory (NT) has a sensible name that cannot be argued about, although the scientist never came by the area. It was for a time called Palmerston (after a British prime minister – watch the film Victoria and Abdul) and was attacked en masse in February 1942 by the same Japanese fleet that violated Pearl Harbour, with at least 243 killed. Throughout the early days of WWII, it suffered from Japanese aerial attacks. A memorial ceremony is held every year on 19 February at the Cenotaph in Darwin. 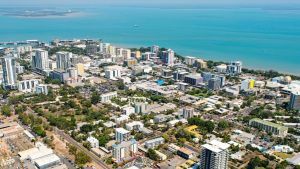 A city with a population of just 150,000, Darwin is best known as the starting point for the famous Ghan Railway to the very centre of Australia at Alice Springs and on to Adelaide. Our visit on Jewel coincided with another cruise ship using the Fort Hill Wharf near the centre of the town, and also the Commonwealth Games baton relay, which meant a curtailed call and half hour courtesy bus ride to the area around the NT Parliament House. Southbound later in 2018, and on the return journey, Jewel is overnighting, a chance to investigate properly a very friendly tropical city. Once in the centre of things, it was quickly on to the Big Bus Hop-On-Hop off tour, 90min if you want to stay on all the way around. We managed three stopping points, all recommended. From the top of the bus we could also see East Point Reserve, a public park and home to abundant wildlife including wallabies, bandicoots, brushtail possums and numerous species of reptiles, butterflies and birds. No chance to experience saltwater swimming at Lake Alexander. First and possibly the best stop was the Museum and Art Gallery of Northern Territory with free admission, a large complex covering the Aboriginal story of the area and WWII. Art is well displayed with a collection of traditional and contemporary pieces. One gallery features a spectacular display of boats, canoes and other watercraft that connected Australia to distant lands for hundreds of years. There was also a graphic rendition of Cyclone Tracy, which destroyed the city at Christmas 1974, killing 64 people. Next up was the Military Museum and Defence of Darwin Experience complete with a 9.2in gun emplacement. We sat back in the air-conditioned theatre and watched the fascinating short film that uses actual footage from the attack to depict the bombing as it happened more than 75 years ago. Finally, and near the main cruise terminal, the Royal Flying Doctor Service has mounted a fine facility designed to promote its wonderful work since its foundation 90 years ago. On display is a full-size replica of a Japanese Zero aircraft with an exhibit beneath the floor showing Darwin Harbour as it was in 1942. 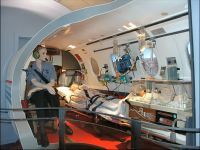 The facility features a life-size hologram of Rear Admiral Etheridge Grant, commander of the USS William B. Preston, who tells the remarkable story of his survival and that of his crew during the bombing. Much more modern is a “retired” RFDS Pilatus PC-12 aircraft fuselage fully kitted out. “Why such a modern aircraft?” the question was asked. “Maybe a heavy landing” was the quick response. An impressive display nevertheless.